"Wordplay" redirects here. For other uses, see Wordplay (disambiguation). Word play or wordplay (also: play-on-words) is a literary technique and a form of wit in which words used become the main subject of the work, primarily for the purpose of intended effect or amusement. Examples of word play include puns, phonetic mix-ups such as spoonerisms, obscure words and meanings, clever rhetorical excursions, oddly formed sentences, double entendres, and telling character names (such as in the play The Importance of Being Earnest, Ernest being a given name that sounds exactly like the adjective earnest). Word play is quite common in oral cultures as a method of reinforcing meaning. Examples of text-based (orthographic) word play are found in languages with or without alphabet-based scripts; for example, see homophonic puns in Mandarin Chinese. Another use of fossils is in using antonyms of unpaired words – "I was well-coiffed and sheveled," (back-formation from "disheveled"). Many businesses use word play to their advantage by making their business names more memorable. 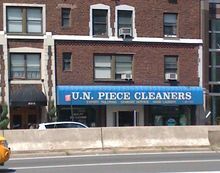 This business is located near the United Nations Headquarters and plays on the term UN Peacekeepers. Most writers engage in word play to some extent, but certain writers are particularly committed to, or adept at, word play as a major feature of their work . Shakespeare's "quibbles" have made him a noted punster. Similarly, P.G. Wodehouse was hailed by The Times as a "comic genius recognized in his lifetime as a classic and an old master of farce" for his own acclaimed wordplay. James Joyce, author of Ulysses, is another noted word-player. For example, in his Finnegans Wake Joyce's phrase "they were yung and easily freudened" clearly implies the more conventional "they were young and easily frightened"; however, the former also makes an apt pun on the names of two famous psychoanalysts, Jung and Freud. An epitaph, probably unassigned to any grave, demonstrates use in rhyme. He was killed with a gun. Crossword puzzles often employ wordplay to challenge solvers. Cryptic crosswords especially are based on elaborate systems of wordplay. Young Thug used a play on words in his verse on "Sacrifices" by Drake featuring 2 Chainz and Young Thug. You get it? I said I'ma username, like, "Who is he?" Word play can enter common usage as neologisms. Word play is closely related to word games; that is, games in which the point is manipulating words. See also language game for a linguist's variation. Word play can cause problems for translators: e.g. in the book Winnie-the-Pooh a character mistakes the word "issue" for the noise of a sneeze, a resemblance which disappears when the word "issue" is translated into another language. ^ "wordplay: definition of wordplay in Oxford dictionary (British & World English)". Askoxford.com. 31 July 2013. Retrieved 6 August 2013. ^ "Drake - Sacrifices Lyrics in Genius". Genius.com. Retrieved 19 March 2017.